Starting tomorrow, I will be flying out with 19 others to spend the week in Jinotega, Nicaragua hopefully helping to do some good for the people there. I am assuming that access to the modern devices we take for granted will be limited so there’s a possibility that I will be un-gridded for an entire seven days. I am guessing by day there might be a small breakdown on my part. Due to its succinct nature, the easiest form of mass communication for me would probably be Twitter, feel free to follow along this week (and regularly thereafter) and I will do my best to post interesting finds about my stay if possible. I am not taking a huge camera so hopefully my phone will suffice and hopefully I won’t get in too much trouble for hanging on to it. Our work is being coordinated through Misi? ?n Para Cristo, a non-profit organization located in Jinotega, Nicaragua. Feel free to look through their photos of the area and work that they do at http://photos.misionparacristo.com/. A separate image search found this gallery as well for the Jinotega area. And if you’re one for reading, http://en.wikipedia.org/wiki/Jinotega and/or http://www.amigosdenicaragua.org/jinotega.htm both share a little more information. 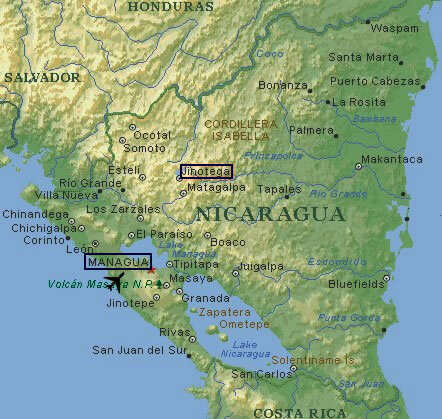 And a Google map to give you an idea of where Nicaragua is located – Latin America between Honduras and Costa Rica. Thank you all for your well wishes and prayers on our behalf and for the people of Nicaragua. Thanks also to all who have donated to my trip, your support is immensely appreciated. I will try and do my best to journal my time there in hopes that I can better share it with everyone.